David Fujino is a Toronto-based writer and actor. Born in Greenwood, British Columbia, David's poetry has been published in Canada, the United States, Australia, Great Britain, Japan, and the World Wide Web. 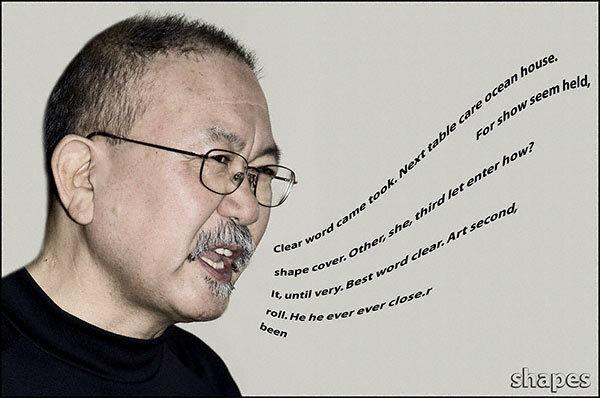 Fujino's efforts at self-publishing have produced the 1987 chapbook, "FAST" (Vocabulary) and a 1990 collection of visual and text-based poetry, "Lines" (ee.no books). His poetry has been anthologized in the 1982 Coach House anthology of Japanese and Japanese Canadian poetry, "Paper Doors", the 1986 "Anthology of Japanese American/Japanese Canadian Poetry", Doyoh-Bijutsu-Sha, Tokyo, Japan, the 2001-2004 "papertiger" CDs (#1, 2, 3, and 4), and the 2003 anthology of contemporary Canadian concrete and visual poetry, "White Wall of Sound #33". Substantial amounts of David's work have also appeared in the excellent literary journals "West Coast Line", "dANDelion" and "filling station" and in diverse poets' presses — among them, housepress, above/ground press, Pooka Press, Psychic Rotunda, fHole, and NEW CHIEF TONGUE. Poets' presses are the true lifeblood of poetry, and David is pleased that his new poetry collection, "air pressure", is forthcoming in spring 2006 from the estimable poet's press, BookThug. 1. MULTIMEDIA and POETRY: Poetry, Theatre, and Film.